Furby is a soft loveable, teachable, interactive virtual pet game toy from Hasbro. Designed by Dave Hampton and Caleb Chung, Furby, an owl like pet toy, was launched in late 1998 by Tiger Electronics (which became part of Hasbro that same year) and quickly became the "must have" Christmas toy in 1998 and 1999. 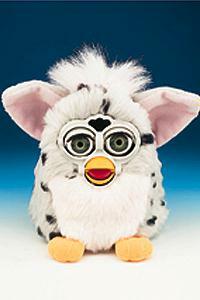 They sold 1.8 million Furbies in 1998 and Furby sales jumped to 14 million units in 1999. Furby was not Tiger Electronic's first foray into virtual pets, they launched Giga Pets a few years earlier to compete with Bandai's Tamagotchi virtual pet. Dave Hampton worked on the electronics while Caleb Chung worked on the toy body and the mechanics. Together, they were able to incorporate a microphone, light sensor, infrared sensor, pressure sensors to detect being touched, an inversion switch (tilt sensor), an electric motor, the ability to speak and communicate with other Furbies, and many other technologies into this toy that initially retailed for about $35. When you first pull Furby out of the box, he speaks his own language, Furbish, then he gradually begins speaking English. Part robot, part animatronic, part fur, and part love, Furby took the toy world by storm. His original production run lasted thru 2000, and sold over 40 million Furbies in 24 languages. Furby was re-released in 2005 in a run including Emoto-Tronic Furby (Furby, Baby Furby, and Funky Furby). Emoto-Tronic Furby was much larger than the original classic Furby. Furby was once again retired in 2007. Furby was also available as a plush non-talking "beanie baby" type pet called Furby Buddy / Furby Buddies. In addition to being available in several different models over the years, Furbys were also available in almost countless color combinations. A few Furby varieties are shown below. Furby has been in the news since his release in 1998. Links to several major Furby news stories are below. A 16 September 1998 Furby's first press release from Tiger helped this virtual pet kick off the Christmas season that lasted two years. 12 March 1999 Tiger introduced a QUIETER Furby, by 1999 some people thought Furby made too much noise so Tiger made an improvement to allow them to quiet down their Furby. The toy normally quiets down when it is left alone a while. The change will force its users to turn the toy upside down and back up again to start it chattering again. The improvement prevents a casual bump or intrusion from launching the chatterbox speaking Fubish, English, or making other noises again. In March of 1999, McDonald's offered small plastic McFurby's as a Happy Meals Toy. In 2000, McDonalds gave out twelve differnt collectable Furby plush key ring virtual pets. 2 October 1998 Tiger Electronics webcasted Furby's debut at FAO Schwartz. 12 October 1998 Cuddly - And With an Attitude. Business Week. Page 105. This article is below. March 7, 1999 Sunday Mail (Glasgow Scotland) reported Young and the Restless actress Candice Daly and her boyfriend, Quentin Guitierez (a comic) were saved from a house fire. A Furby started yelling at 3am when a chest of drawers was on fire after a candle burnt down. The incident was also reported in the National Enquirer. SMART TOYS DON'T NEED A LOT OF COMPUTER SMARTS. Witness Furby, a garrulous and ingratiating new fuzzball that could be this Christmas' Tickle Me Elmo. Like many other chip-enhanced dolls, Furbies talk, giggle, open and close their eyes, and respond to pokes, tilts, or tickles. But this latest electronic pet is amazingly convincing--in part because, like real pets and some family members, its reactions are a bit out of whack. Furby's inventor, David M. Hampton, planned things that way. In the process, he saved Furby's manufacturer--Tiger Electronics Ltd., a unit of Hasbro Inc.--a bundle in manufacturing costs. To hold Furby's list price to $30, less than one-third the cost of Microsoft Corp.'s ActiMates Barney doll, Hampton and the Tiger development team used some ingenious shortcuts. Instead of expensive communications circuits--the kind that permit wireless messaging among various computer devices--Furbies exchange crude infrared signals to trigger spontaneous-sounding giggles and goofing sessions. As for processors, the toy's silicon brain is a low-cost Asian variant of the chip that powered the original Apple II. Furby has trouble doing two things at once, and that's just fine, since carefully crafted software rules give the illusion of complexity. Talking, for example, always takes priority over listening. So Furby sometimes seems a little unresponsive--not unlike some children we all know. Likewise, while the toy is in motion, its sound sensor automatically switches off, which saves battery power and prevents motor noise from confusing the sensor. Furby's 1,000 bits of trainable memory manage a vocabulary of just 200 words. But these words get combined in ways that even the inventor never predicted. The effect compares favorably with a hamster, and beats the heck out of a pet turtle. Copyright 1998, by The McGraw-Hill Companies Inc.
Hasbro has done a nice job of posting the instructions for many Furby models online. Crow like a rooster - cover his eyes 3 times, then pat him on the back. Say his name - scratch Furby on the stomach 3 times (some claim that is tickling him), then pat him on the back. Hum Twinkle Twinkle Little Star - clap 3 times and pat him on the back. Hiccup - tilt Furby back and forth toward you about a dozen times. Furby will continue to hiccup when you tilt him for a while. Burp - feed Furby 3 times in succession. You feed him by poking your finger or something into his mouth/beak. Being a Furby could be risky. Some users performed a Furby autopsy, while others tried to hack / bend his electronics. Furby relied a lot on humans interpreting his actions as life like responses, and we did. He was really pretty dumb. One source says the Classic Furby had about 80 kilobytes of chip space. 50K was used for talking, 20K for movement, and about 8K for the program. When Furby was originally discontinued in 2000, Tiger Electronics / Hasbro quickly tried to build on that success with more interactive toy virtual pets. Shelby was announced in an April 9, 2001 press release. 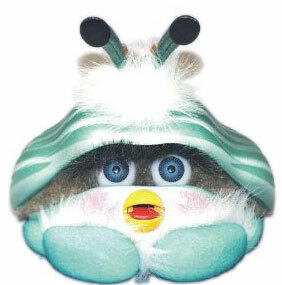 An animatronic / robotic clam with an attitude similar to Furby, Shelby could also speak Furbish and English, as well as interact with Furby, Furby Babies, Furby Gizmo, and Furby Emoto-Tronic (Emototronic). Shelby enjoyed some strong initial success, but started to fade. 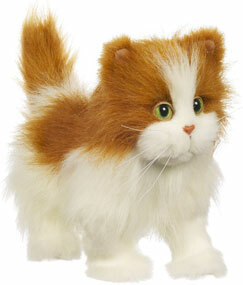 In 2002, Tiger Electronics / Hasbro launched the FurReal Cat. It enjoyed a great Christmas and has since been followed by a host of FurReal Friends. In 2005, Tiger Electronics / Hasbro relaunched the Furby as a new larger interactive virtual pet with even more features. Emoto-Tronic Furby came in several models (Furby, Furby Baby, and Funky Furby). We suspect Tiger / Hasbro will continue to milk this segment as long as these products are profitable, and hope to see some even more "life like" virtual pets from them in the future. In June 1999 a nice family (Rackley's) that owns 4 furbys sent us some trouble shooting tips. They are listed below. have lost your Instructions, or just need help, please read this note. 3. P: Whenever I feed Furby, he says "Me no like" or "Kah/Boo/Toh-Loo"
working properly, you can send it back to TIGER, LTD.
Like some other very successful virtual pets, for a while, Furby even had his own board game.